Needless to say, I love coffee. I find it hard to get going in the morning without the customary cup or three of my favourite brew. I also love watching my colleagues arrive at the office in the morning and then witness the transformation that occurs from the time they arrive to the time they’ve had their first cups of coffee. A long time ago, deep in the coffee forests of Ethiopia, there wandered a goat herder named Kaldi. One day, Kaldi observed his goats eating the berries of the coffee plants and shortly after, observed a sharp spike in their energy levels – so much so, that they didn’t sleep that night. Finding this curious, Kaldi wandered with this information until he passed the local monastery. He decided to pay a visit to the abbot of the monastery, as he often did. After the formalities were observed, Kaldi told the abbot of the effect the coffee berries had had on his goats. After waving their farewells, intrigued, the abbot decided to test the coffee observation for himself. 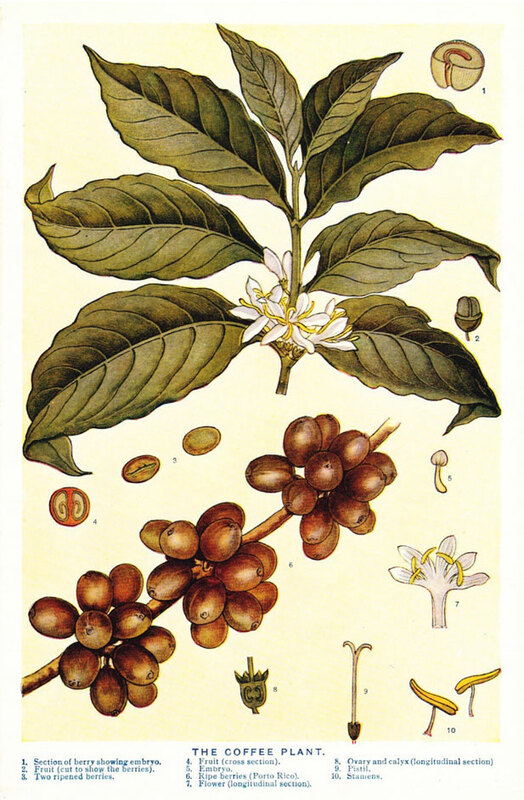 He brewed himself a drink from the coffee berries. That evening, the abbot experienced the most energised and alert prayer hours of his life – gone was the customary battle with sleep. The abbot was so impressed that he shared his findings with his fellow monks. Stories of the berries soon spread far and wide and slowly made it’s way all the way to the Arabian Peninsula. As coffee became known across Arabia, Pilgrims came to know it as the “Wine of Araby” and word of the invigorating drink kept spreading. In the city of Venice, circa 1615, Venetians tried the drink for the first time. They were so alarmed by the sudden spike in energy that they called it “the bitter invention of Satan”. Fear of the effects of coffee created such hysteria that the Pope at the time – Pope Clement VIII – had to intervene. After trying the drink himself, he heartily approved of it as a very satisfying drink and the proverbial dust settled. Continuing its conquest of the world, coffee soon replaced beer and wine as the breakfast drink of Europe, and soon after, in England, “Penny Universities” sprang up everywhere (so named because a cup of coffee cost 1 Penny, and after the consumption of a cup of coffee, groups of people entered into very stimulating discussions). And so, the die was cast for coffee. 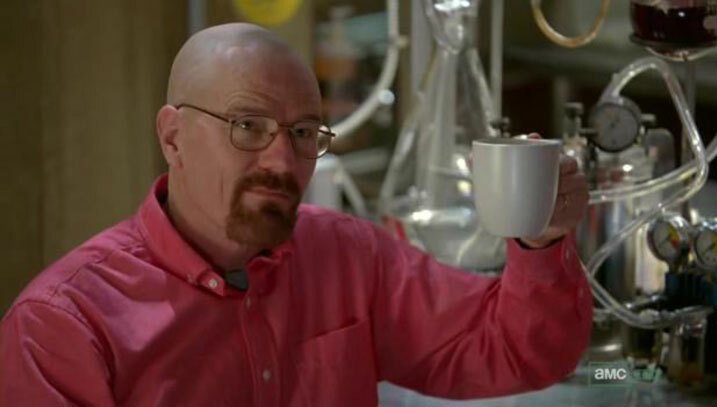 It’s well known that the ingredient in coffee that causes all the fuss is caffeine. Measuring the amount of caffeine in coffee for the individual drinker is problematic because there are so many varying factors that have to be taken into account, however, the effects of caffeine are generally standard and may, most likely, only vary in intensity per individual. Some of the positive psychological effects of coffee include a higher state of alertness and an increase in focus and concentration, which in turn increases attention spans. On the negative side we find an increase in anxiety, depression, irritability and, of course, addiction. According to a CareerBuilder employee survey in the U.S., nearly half of the U.S. workforce agrees that coffee increases productivity. 46% also noted being much less productive when not drinking coffee. In the creative industry it’s particularly valuable, as it gets the creative juices flowing. Some may argue that it inhibits creativity, because the increase in alertness stops the mind from wandering, which is necessary for true lateral thinking. Researchers at MIT agree that the consumption of coffee, both by individuals and groups of creatives, stimulates increases in creativity as it breaks down ‘normal’ social and professional barriers, encouraging lateral thinking. This can be observed in the social convention of ‘getting, or going for a coffee’, even when one or more participating parties does not even drink coffee. This convention is the most prolifically used substitute for more difficult to ask requests like: “Will you go on a date with me? Can we meet so I can interview you? Can we talk about that very sensitive thing now? Can I speak to you alone about something that’s gone wrong?” People are a lot more likely to agree to these awkward meetings and conversations if it’s posed to them as “Let’s talk about it over a coffee”. Moreover, once you actually have your coffee or tea or whatever you choose to consume in these ‘meetings’, you have something to keep your hands busy with and to stare at when things become too awkward. All of this comes together to facilitate better communication – the life force and proverbial ‘dark art’ of any successful enterprise or relationship. 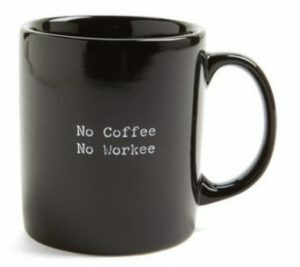 From this it’s easy to conclude the statement that can be found on many a mug, placemat, mousepad and even t-shirt: “No coffee – No workee”.